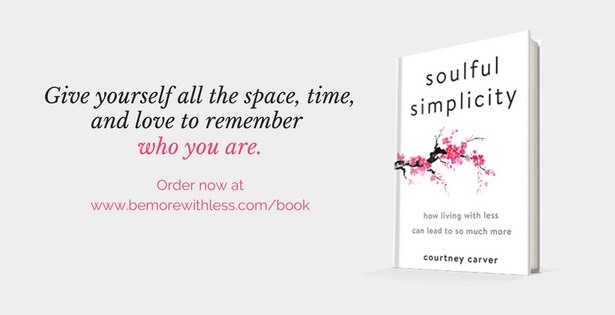 If you’ve read my book, Soulful Simplicity, you know that author, Elizabeth Gilbert and her work has influenced my work and my life. 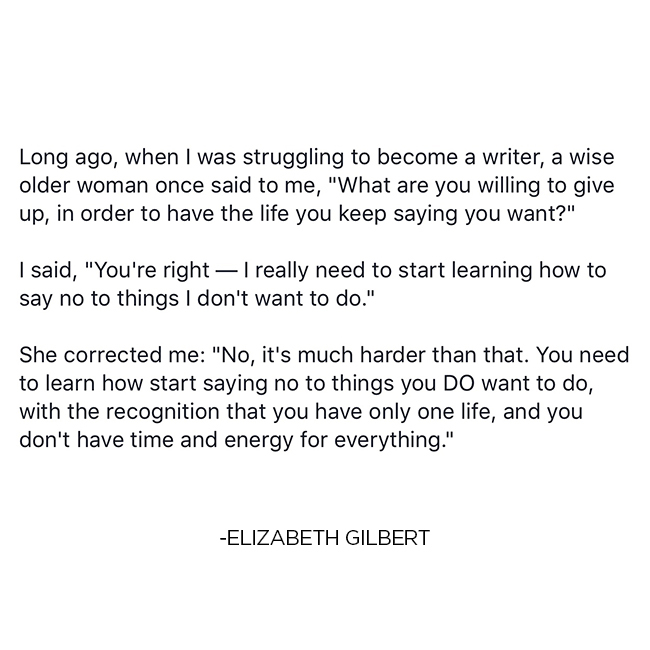 The following Gilbert wisdom flows in and out especially when I feel unmotivated to change, or to take the next right step, or to do something hard. If you feel unmotivated sometimes, this can help you too. We all want things out of life. The changes we want are different but perhaps you want to be healthier, downsize, pay off debt, improve your relationships, change your career or carve out time to figure out what you really want. Chances are you’ve wanted this for a really long time but there’s a good reason it hasn’t happened yet. You may have a really good reason for being unmotivated. If one of the following reasons is holding you back, here are a few solutions to consider. Your partner or family isn’t on board. They don’t want to make the same changes you are making. You may not have a cheerleading squad to help motivate you, but you can be the change. Inspire your family by moving forward anyway. Take small steps. Have gentle conversations about why you are making a change. Invite them to join you but don’t drag them. Make your simplicity journey fun and light-hearted by hosting a minimalist scavenger hunt, or play other games like I describe in this video. Create your own squad online by curating your social feeds to support whatever change you are making. Unsubscribe to the stuff that drags you down. Tag me on Instagram or Twitter or comment here and I’d be honored to cheer you on. If you are struggling with a chronic illness or pain, or you are sick and tired for another reason, it’s time to take care of you. You’ve done a great job taking care of everyone and everything around you and now it’s time to do what’s best for you. Take all the time you need to give that gift to yourself. Big change usually comes with some slipping and sliding, a few steps forward and then even more steps backward. Don’t beat yourself up or let guilt hold you back from trying again. Be good to yourself. Take care of your body, heart, mind, and soul. Good things take time. You’ve got this. Maybe you’ve decluttered before, and then filled up all the spaces. Or, you’ve been paying off debt for years and are derailed by a job change or health issue. Maybe all of your progress feels like one step forward and two steps back. Take a minute to breathe, to reflect on the good parts, and to remind yourself that slow progress is still progress. When you are ready, consider the joy of the steps. Stop saying yes when your heart says no. Your no doesn’t need a lengthy explanation or apology. Saying no more honestly will give you a chance to say yes and allow you to show all the way up for people you love and work you care about. Change your measuring system. Stop measuring who you are by what you cross off your to-do list. Measure more by what’s in your heart and by how you treat people, including yourself. If you notice you are feeling down because of the things you left undone, remind yourself who you are and what you mean to the people around you. When life gets busy, complicated, and overwhelming, it’s easy to forget who you are, but you can find your way back. Sit down. Close your eyes. Breathe. Keep doing that for a while. Then put your hands on your heart. There you are. Keep finding your way back. Do it over and over again. Give yourself all the time, space and love you need to remember who you are. If you need help, ask for it. Some of the things you want may feel completely out of reach, and maybe they are for today. But there is hope. If you start removing the things standing in your way, weighing you down, and holding you back, you’ll take a step closer to the life you want. Maybe you don’t want a simple life, but simplicity is the vehicle that will carry you towards the life you want. 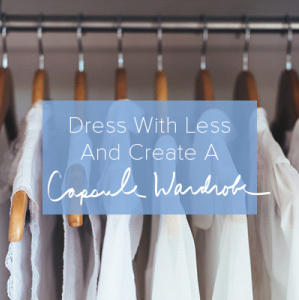 Removing the excess, saying no, and noticing what matters to you will help you get there. Next week I’m hosting a webinar to tell you more about A Simple Year. It’s a 12-month program I’m offering for the last time in 2019. 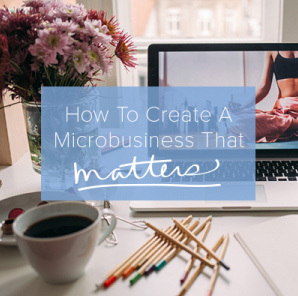 This webinar won’t be an hour of me trying to convince you that you need this course to simplify your life. I won’t be using fancy, persuasive techniques or Powerpoint presentations to get you to sign up. Instead, I’ll invite you into my kitchen and tell you what to expect from the program. Then, I’ll answer any questions you have so you can decide if you want help, and so you can determine if this course is right for you. If you sign up, I’ll send you a recording (audio and video) even if you can’t attend the live session on November 7th. So back to finding the motivation and finding the will to change, or to take the next right step, or to do something hard. Maybe what you need more than motivation is time and energy. What are you willing to give up, in order to have the life you keep saying you want? Ask this question about your health, your work, and your relationships. When you think, “I could never give that up,” you’ve probably found your answer. If you ask yourself this question over and over again and begin to honor your answers, you’ll get the time, the energy and the motivation you need. You’ll get that life you want. Hi, Courtney. I would LOVE to get some encouragement! I typed up several copies of Joshua’s words, “The first step in crafting the life you want is getting rid of everything you don’t!”–super large print on plain paper and taped ’em up. I stare at them every day. Make that, I SIT and stare at them every day. I’m a 71-year-old widow who moved from 3000 sq ft into 500 sq ft (plus a storage unit), so I’ve gotten rid of plenty. However, my apartment is, well, barely livable. I have your forms. I know what to do. I just sit on my duff and don’t do anything. Instead of thinking about decluttering your entire apartment or facing the whole storage unit, commit to filling one box with stuff and either bringing the box to a donation center or asking someone to pick it up. Let me know when you’ve got one box out the door. Finally! Yes, it felt great filling it up; however, the stark reality is–I don’t see a difference. I’m surrounded, literally, by stuff everywhere I look. Except for my boys (2 cats) who keep me sane! Ok. Enough whining. Onward and upward. Happy November! Then do one box the next day/week/month. And again and again until it’s cleared out. Or start with one small area (clean this corner or the living room) and do that. Then, pick another small area to do (these shelves in the kitchen), and keep going and going with small areas and small victories. You eat an elephant one small bite at a time. Wow, this is incredibly tough. I loved that quote, but it made me realize that I’m that person who wants to have everything and do everything. I let go of the things I didn’t want, but I still felt overwhelmed. And, I guess, what I need to do is prioritize a few things, and maybe even one or two goals, and let go the rest. That’s probably why I feel stagnant. Thank you for sharing. Natalie, I think I was you 40 years ago. I had everything, did anything and everything I wanted; I felt untouchable and unstoppable. What I didn’t have or do was a plan for the next chapter or the “what if” that was my husband’s totally unexpected death at 55. So yes, definitely prioritize but also consider the what-if. Not to be morbid or depressing but to be prepared and comfortable. Says the old lady who didn’t and wishes she had (but doesn’t dwell on it)! Thanks, momma! That elephant is one tough bugger, but thankfully I still have almost all of my teeth. Now, where’s that A-1 sauce??? Seriously, thanks. I appreciate the advice.